Provides barrier free pontoon boat to physically disabled at NO CHARGE. IN FURTHER CONSIDERATION for my use of the watercraft made available to me, on behalf of myself, my personal representative, heirs, next-of-kin, minor dependants, spouse and assigns, I RELEASE AND FOREVER HOLD HARMLESS, BARRIER FREE BOATING, INC. together with its owners, officers, directors, employees, members and agents from any and all claims, suits, causes of action, damages, demands, liabilities, duties and obligations of every kind, nature and description, known and unknown, arising out of or alleged to have arisen out of or which may hereafter arise in connection with my use or control of the watercraft provided to me, including my entrustment of the vessel to any third party. I acknowledge that the operation and control of any watercraft requires certain skill, training and knowledge. I further understand that the operation of a watercraft has certain inherent risks, hazards and dangers which cannot be completely eliminated despite all safety precautions. I understand these risks, hazards and dangers and I believe and represent that I possess the requisite skill, training and knowledge necessary for me to safely operate the available watercraft. I understand that I have the responsibility to take necessary care for my own safety and well-being and that of my passengers. My use of the watercraft is purely voluntary and is done so with full knowledge of the inherent risks, hazards and dangers involved. I hereby assume and accept all risks of injury or death in connection with my use of the watercraft. 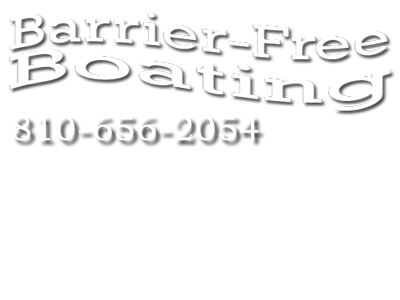 IN FURTHER CONSIDERATION, I agree to defend and indemnify, BARRIER FREE BOATING, INC. from any claim, suit or liability for damages to any person or property caused directly or indirectly by my use or control of the watercraft, including my entrustment of the vessel to any third party. This duty shall be primary such that any insurance coverage available to any indemnified party shall be excess to this Agreement. BY SIGNING THIS DOCUMENT, I UNDERSTAND THAT I AM GIVING UP CERTAIN LEGAL RIGHTS, INCLUDING THE RIGHT TO RECOVER DAMAGES IN CASE OF INJURY, DEATH OR PROPERTY DAMAGE. READ THE AGREEMENT CAREFULLY BEFORE SIGNING IT. YOUR SIGNATURE INDICATES YOUR UNDERSTANDING OF AND AGREEMENT TO ITS TERMS. THIS AGREEMENT GOOD THROUGH 2014 BOATING SEASON.